There are two different and equally compelling legends about the name of this mountain. Ask the locals about it. 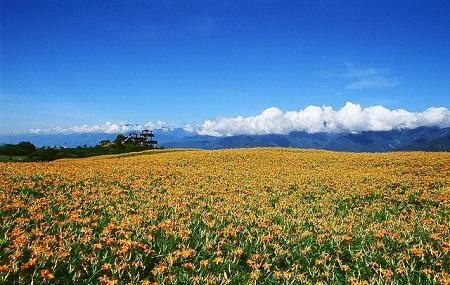 Rising 800 meters above sea level, the rolling slopes of the mountain are home to one of the finest sights in the whole island - an undulating carpet of daylily flowers, spreading for about 300 acres. This beautiful sight only blooms between August and September though. Also called Golden Needle Flowers, the edible stems are frequently used in the local cuisine. If you arrive in mid-January, you’ll see a bloom of rapeseed flowers. Even if you arrive at other times, though, you’ll still be treated to beautiful rolling hills. Drive to here or take a scooter. Take a train from Hualien Staiontion to Fuli Station, where you may find a taxi to the mountain. How popular is Sixty Stone Mountain? People normally club together Tai Dong -bi Xi Li An ~ji Mi Cun and Yu Chang Tunnel while planning their visit to Sixty Stone Mountain. We took a scooter up the back road - very beautiful. The top is stunning, and scenic. Even off season, it is worth a stop - everything is very green! You can spend hours there just gazing down the valley. A really charming and local place with nice Mountain landscapes, definitely worth visiting. Be aware, during the lily season it might get very difficult to go around the narrow mountain roads with the car, but in November most of the places (tea house and local food/souvenirs shops) are closed... Also one of the 2 roads accessing this area might be closed and you will find only a sign in Chinese telling you that! We took the train to Fuli Station and managed to easily find a few others to share a cab with. It worked out to 350 NT per person for a round trip. The views are truly awesome and the flowers were in bloom when we visited which added so much more to the beauty of this place. Tough road to get up. View is nice on a clear day. Highlight is the friendly cats at the top.